Emerging electronic artists have until May 22 to enter this year’s Incubator Program. 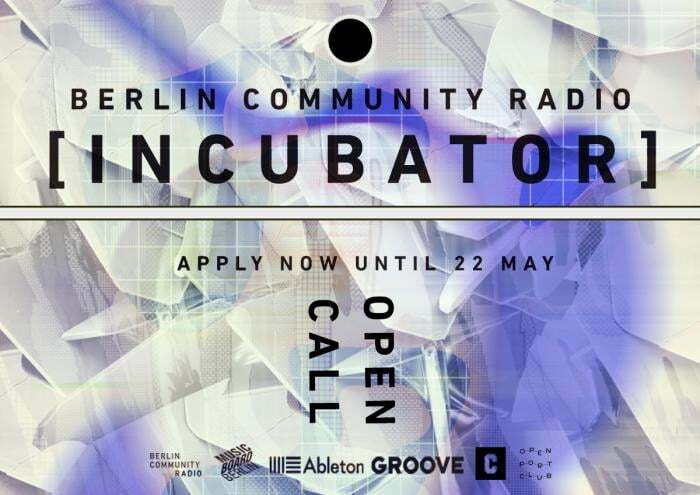 Last year Berlin Community Radio launched the BCR Incubator, a program which offered four emerging electronic artists a mentorship program and a month long residency on the station. This year the program returns offering even more. BCR are offering six emerging electronic artists a month long live residency, industry mentoring, an international press and PR campaign, plus the chance to play in Sapporo, Japan. The focus of the project is again on applicants who are underrepresented in the music industry such as WOC, queer trans POC, disabled artists, and those with immigrant backgrounds. - One month long BCR radio residency. - Perform live at BCR’s club of the month. - Master, remix, and release your music. - Ableton Live 9 full license and individual specialist training. - The opportunity to take part in a series of Ableton workshops. - International PR and press campaign. - Full promotional campaign across BCR social media channels. - Support, advice, management, and contacts. - The opportunity to be invited to an artist residency program in Sapporo city, Japan, conducted by Open Port Club in late summer. A jury will choose four winners, which includes the following: Tabitha Thorlu-Bangura (NTS), Frankie Hutchinson (Discwoman), Anu Ambasna (Rhythm Section), Yuko Asanuma, Anastazja Moser (BCR), and Sarah Miles (BCR) will choose four acts at the end of April. To be eligible to apply you must live in Berlin and have at least one track online. Head here to apply.